Your crush is grinning at you from under the mistletoe! The lights are dim! The eggnog is potent! The snow is making romantic patterns on the windows! This is your chance for silver-bell smooches! But woe, you just remembered, you had chicken parmesan for dinner, and the nefarious forces of garlic and onions are holding your breath hostage! 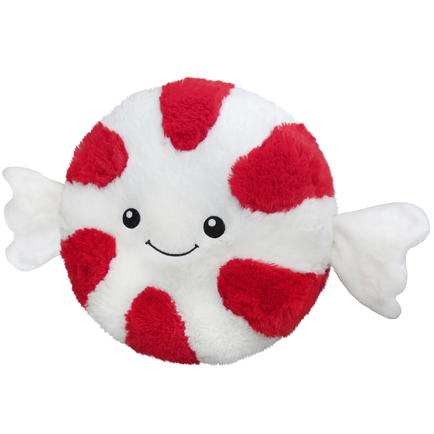 Peppermint is the red and white striped superhero of the holidays! Gasp at his breath-cleansing bravery as he swoops in and saves your kissing ability just in the nick of time! This dude might spend most of the year playing incognito in Grandma’s candy dish, but in December he’s there just when you need him the most. Thank you, little peppermint! 15 squishy inches of minty-fresh justice. All new polyester fiber, ages 3 and up only!